Start your first day by fueling up on Blue Bottle Coffee and exploring the Ferry Building Marketplace, the hallmark of San Francisco cuisine. You’ll find good bread at Acme Bread Company, amazing cheeses at Cowgirl Creamery, and delicious confections at Dandelion Chocolate and Recchiuti Chocolate. On Tuesdays, Thursdays and Saturdays there’s a farmers market outside with even more vendors, including Tacolicious, Roli Roti, and Wise Sons deli. Head out to the Marina neighborhood for a walk along Crissy Field where you'll be treated to views of San Francisco Bay, Alcatraz, and, of course, the Golden Gate Bridge (that is, if Karl the Fog hasn't already rolled in for the day). It’s about a two-and-a-half mile flat trek from the Marina Green out to Fort Point the Gold Rush-era fortress beneath the bridge that also made an appearance in Alfred Hitchcock's 1958 thriller Vertigo. Once you’re through exploring, return to Fort Mason (just east of the Marina Green) for a bit of light imbibing at The Interval, one of TripSavvy's Best Bars for 2018. Part bar, café, and museum, this space plays with your perceptions and serves up some killer cocktails and ice cream sandwiches. SF's North Beach neighborhood is brimming with dining options. 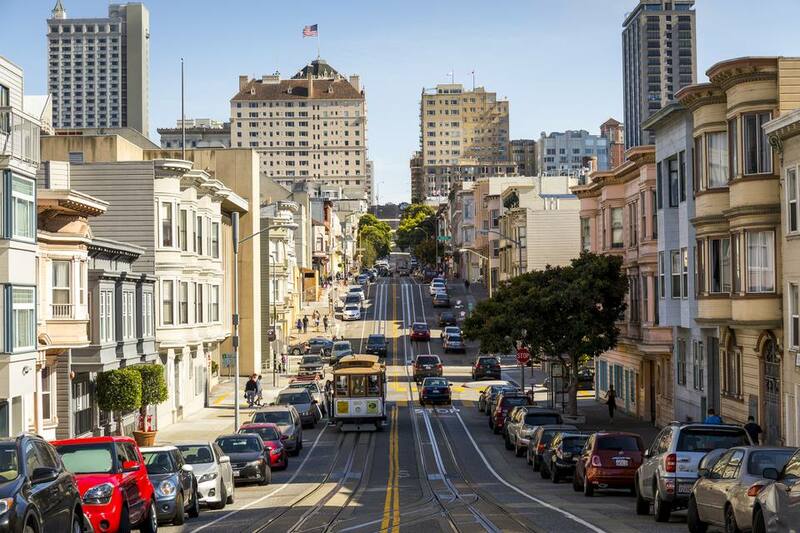 Known as San Francisco’s Little Italy, this hillside community features everything from tiny mom-and-pop pasta eateries to pizza joints and fine-dining establishments. You can get nearly any style of pizza you want at Tony's Pizza Napoletana, just be ready for a wait. In the interim, make yourself at home at next door's Original Joe’s with a budget-friendly martini and a fireside spot (the perfect date-night perch, FYI). For pasta lovers, head on over to Ideale on Grant Avenue. This tiny trattoria whips up homemade spaghetti, parpardelle, tortelloni, and every other kind of pasta imaginable, plus the owner is an incredibly friendly Italian who loves to share details and stories on the neighborhood. Once you've eaten to your stomach's content, top your evening with a night-cap. North Beach is full of good bars, like the beer-savvy Church Key, and 15 Romolo, with 20+ years of keeping conversations lively with quality sangria and cocktails. Finish off your night with a trek up the stairs of Telegraph Hill to bask in the illuminated beauty of iconic Coit Tower (the tower itself is closed at night, but surrounding Pioneer Park offers exquisite city views, including those of the Bay Lights on the Bay Bridge, which simply illuminate the sky). Lace up your comfortable shoes because you’ll be spending a lot of time on your feet today. After a leisurely a.m., begin your explorations with a visit to the recently remodeled San Francisco Museum of Modern Art (SFMOMA), home to seven floors full of contemporary art works. Grab a cup of Sightglass Coffee and a pastry at the café on the third floor, which is almost entirely dedicated to photography. Peruse the displays, then continue on through everything from German impressionism to pop art, not to mention two sculpture terraces. It's a big place to tackle in a day, so choose the exhibits that most interest you. Next, get ready to explore San Francisco’s wild side! Take a Lyft out to Golden Gate Park to explore the city's Botanical Garden. You’ll find blooms from as far away as Australia and Japan, as well as 150-year-old redwoods grown from seedlings right inside the park. If you're craving a bite to eat, take a side-trip to Nopalito in the nearby Inner Sunset. This lively eatery focuses on authentic small-plate Mexican fare that's out-of-this-world taste-wise, and just a few minutes stroll from the gardens. Later, continue west to San Francisco's Ocean Beach, and its Sutro Bath ruins to take in the sunset. Watching the sun dip below the Pacific from the remnants of this once-great bathhouse (which mysteriously burned down in 1966), is an unforgettable experience. San Francisco’s buzziest neighborhood is by far the Mission. It's filled with exciting new restaurants and old divey bars that have somehow withstood the city's rising rents and the tests of time. It feels almost wrong to find yourself in this neighborhood and not try Mexican food, and you'll find some of the best Mission-style burritos (meaning 'packed-to-the-gills') at Taqueria Cancun and Pancho Villa. For a more sit-down affair that's still south of the border, opt for Lolinda. This Argentinian steak house is large enough to take walk-ins, but still full of delicious menu surprises (although both steak and ceviche are musts here). Afterward, head up to El Techo, the restaurant’s affiliate rooftop bar, for a margarita paired with spectacular city views. Looking for a casual hangout? The Homestead serves up free popcorn and heavy pours. If music is your thing, DJs at the Make Out Room gets dance parties going with everything from funk to hip-hop; while Amnesia hosts live bands, including Bluegrass Mondays and Swing Jazz, every first and third Sundays.